To view and purchase ARTiPLAQ-mounted customized reproduction NOAA nautical charts, select a Chart Region (to left). Contemporary, classic nautical charts plaque mounted, ready to hang on the wall. Archival-printed, with traditional land & sea colors. 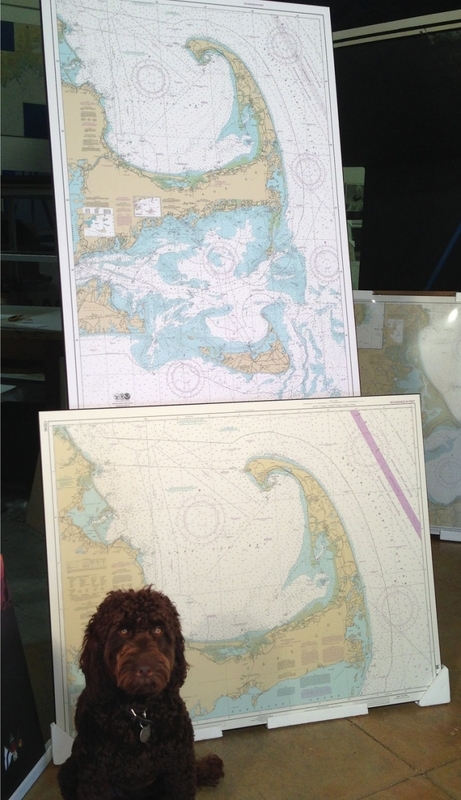 Customized NOAA nautical charts, ARTiPLAQ-mounted. 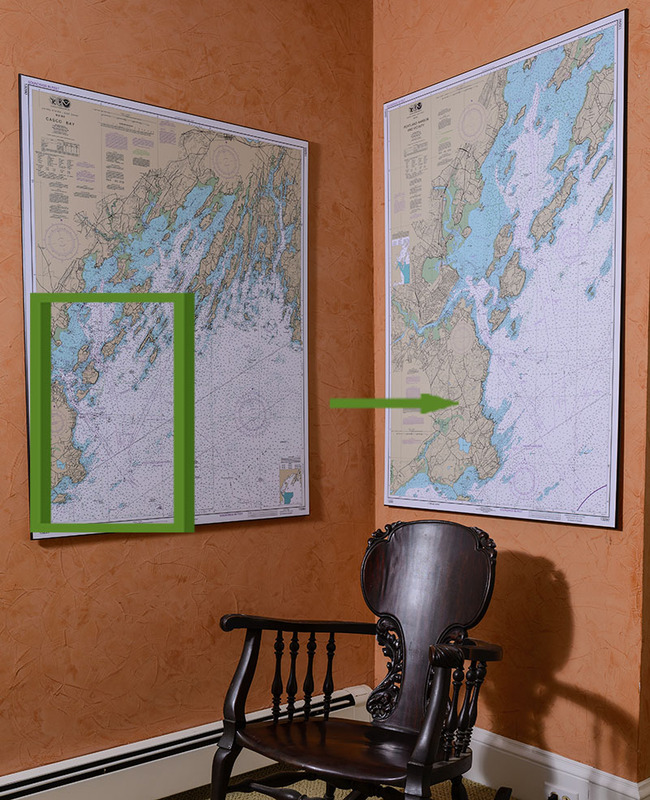 ARTiPLAQ™ mounted customized NOAA nautical charts add coastal décor and local flavor to homes, hotel & office lobbies and cottages far from the sea. 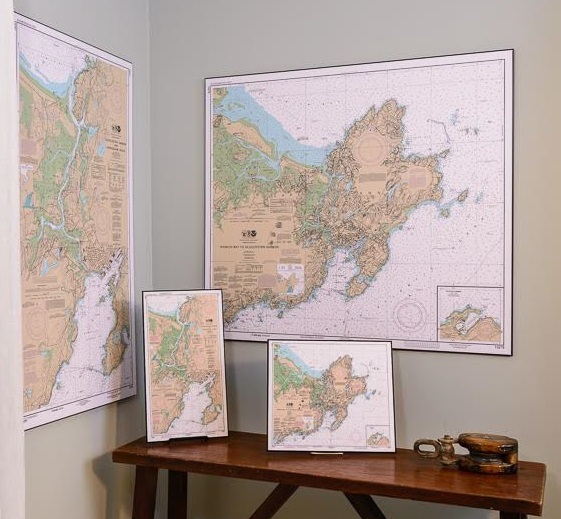 Hand crafted in Maine, ARTiPLAQ™ preserves charts, maps and other prints, with a contemporary, frame-free style, ready to hang on the wall. Along the Northeast coast, you can purchase ARTiPLAQ charts in harbor town gift shops, ship chandleries and home furnishing stores from authorized ARTiPLAQ chart dealers. They make perfect housewarming gifts, wedding gifts, Father's Day gifts, and more! To view charts, click on a Chart Region (upper left). Typically, we leave a one inch margin outside the black border, but we can crop to your specifications. To request custom cropping, or enlargements of a section or entire chart, email us your chart number and instructions. We'll email you back a price quote. Prices are based on the finished size. For more information on our Plaq Mounting Process, click here. In Spring of 2014, NOAA (the National Oceanic and Atmospheric Administration) outsourced the printing of nautical charts to eliminate the high cost of lithograph printing from their budget. Since then a number of companies have started printing NOAA nautical charts. Paper quality, printing processes and colors vary per vendor. Our intention at ARTiPLAQ has always been to have the highest quality chart to grace the walls of your home. We were pleased with the high quality lithograph-printed charts NOAA produced on their cream colored paper for decades. They are collector's items now. Since NOAA outsourced the printing of charts, we've partnered with a fantastic Printer who prints customized reproduction NOAA charts for us. These charts are of a higher quality than most others on the market. They are printed on a bright white archival paper with compatible, high quality inks. The land and sea colors are comparable to NOAA's traditional lithograph colors, with one exception, we lighten the bold magenta shipping chanels. (You can see the difference in the photo below. See the top right corners of each chart? The bottom chart of Cape Cod #13246, is a traditional NOAA lithograph. The top chart is one of our custom compilations #13246 & 13237, printed on bright white paper. We have taken the liberty of reducing the bold vibrancy of the magenta-colored shipping lanes, since our reproduction charts are printed for wall decor, not navigation.) We are confident you will be very pleased with our ARTiPLAQ-mounted charts. ARTiPLAQ-mounted charts are not to be uesd for navigation. We can combine adjacent charts of the same scale. (See top chart on the easel, right). In this example, we combined the Cape Cod Bay chart 13246 with the Nantucket Sound chart 13237. We call it our 'Cape & Islands chart. It comes in two sizes. You can purchase Combo Charts we have already created, or email us a request. We'll email back a quote. Prices are based on the finished size. (The chart on the bottom of the easel was one of NOAA's lithograph-printed charts. You can see our new charts are on a brighter white paper.) Our Combo Charts are considered wall art and not to be used for navigation. 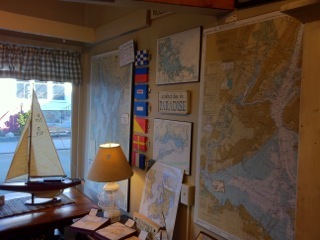 We also sell 'Mini Charts,' which are reduced-size versions of NOAA nautical charts, ARTiPLAQ mounted. They measure approx 13"x 19" and make great gifts. (You can see a photo of them on the table at the very top of this page.) Our mini charts are for wall decor and not to be used for navigation. Here is an example of nautical chart scale: The Casco Bay chart 13290 (left) scale is 40,000. The Portland Harbor & Vicinity, chart 13292 (right) has a scale of 20,000. To view charts, click on Chart Region, (scroll to the top of this page, left).